The first of these elusive indulgences is a pack of good old-fashioned wine gums. My husband has an actual addiction to wine gums (please see this photographic evidence of his shameful private stash. It’s a sorry situation, isn’t it. 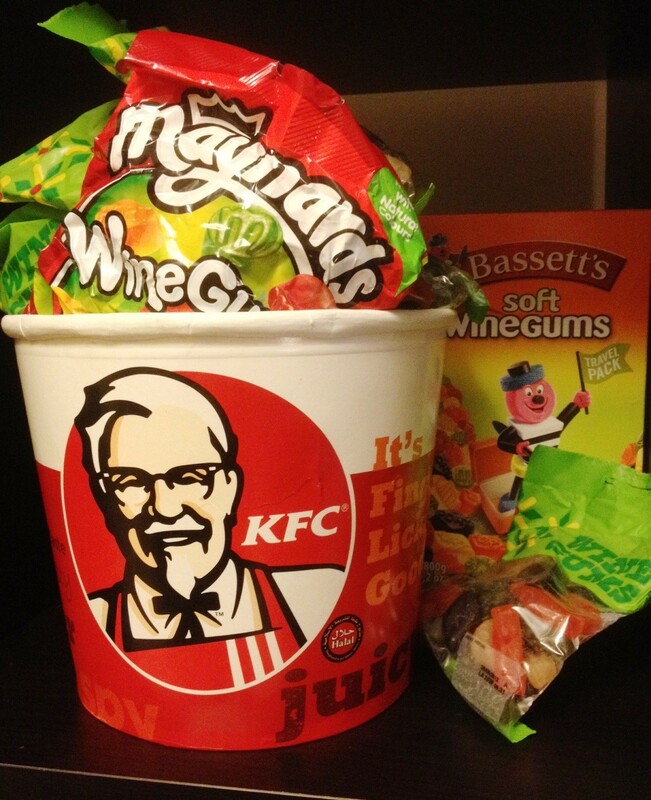 And made so much worse by the fact that he stores them in a KFC Binge Bucket). You can’t get wine gums here in Dubai, though there are plenty of ludicrous sugar emporiums in which you can buy just about every other sweetmeat and confectionary on the planet. There can’t be a porky issue here as wine gums are made with bovine gelatine, so we have therefore concluded that the absence of wine gums can only be because UAE customs officials have been foxed by the word wine. Wine gums do not, of course, contain a single drop of alcohol (although, if they did, it might at least go some way towards explaining my husband’s obsession). To complicate this legal quirk further, wine gums are, bizarrely, very popular in Kuwait – a totally ‘dry’ country. Wine gums were invented by Mr Maynard, Junior, in the early years of the 20th Century and were called Wine Gums to make them sound like a more ‘grown up’ sweet for an older target market – the connoisseurs’ candy, if you will. Although it may have been that Mr Maynard, Junior, was just trying to wind up his father, Mr Maynard, Senior, who was a devout Methodist of the teetotal, temperance variety. The red and black ones are his favourites (my husband’s, not Mr Maynard’s) – I think they are called Port and Claret. Thinking about it now, I wonder if wine gums are actually meant to appeal to children who want to play at mimicking sophisticated adult vices… Like those candy cigarillos… or Babyccino ‘coffees’… Whatever next? Champagne Chupa Chups? Caviar Dip Dabs? It has rained so heavily this weekend, that my poor vegetable are doing doggy paddle to stay afloat in my vegetable patch. I will look at the price of sending you some muddy peas, strawberries and tomatoes. And some wine gums. Can you buy those chocolates that have liquor in them, or are they banned as well? I wonder if anyone has ever tried to get drunk on liqueur chocolates. i think I will have to google it. I’d appreciate a calculation of how many chocolates I’d need to eat to get rat-arsed. There aren’t many things I miss apart from the nearest Marmite being in Miami…but I would like to find a self respecting pear which doesn’t resemble a robin pear made from plasticine. And come to think of it, wine gums would be rather nice too. Pears! Yes!! Oh for a golden, juicy pear! Yes – I feel your pain – I’ve only ever had one decent avocado in six years. Wine gums? I wonder if Bassetts are at fault. I favour their chewy, sweetie-like vitamin gums for my daughter but the pharmacies are forever running out of stock – very frustrating. I tend to bulk buy in Spinneys now. Oh, finally – bananas – please try the small Indian varieties you can find in Lulu – delicious. Nice blog, thanks. I’ll keep all the wine gums and save him!! Wine gums are delicious, though they are readily available here so hardly ever buy them…isn’t that always the way, you crave something that you can’t have, and then when its on your doorstep, you are not bothered. I am about tto head over to Mexico from Australia with a suitcase packed with Redskins and Cadbury Creme Eggs for my friend so i totally understand! YOu have Marks & Sparks? AND Waitrose? Insert green-eyed jealous monster face *here*. Swap you for the nectarine tree in my garden. Deal? DEAL. I think. No wait, hang on. No deal… Definitely no deal. Aw come on, make an effort. I’ll chuck in a couple of nightingales for good measure. I have never tried the whole combination, but you’ve got me tempted now! Ha! I need some of that syndol stuff. The idea of spending an afternoon in a dark cupboard in the back of my brain sounds heavenly!!! You can’t get any decent painkillers in Sicily because they’re so Catholic that they regard pain as a privilege. They wouldn’t even give me so much as a junior disprin when I had my cesarian, for goodness sake! You’ve just supposed to twirl your rosary beads, say a few hundred Hail Marys and think of the heavenly rewards in the afterlife. You can buy all the antibiotics or steroids you want with no prescription, though. Sicilians are funny that way…. It’s interesting that despite the rapid and total transformation of Dubai, ex-pats still experience the same yearnings for things that aren’t available. I lived there in the 1970’s and your comment about lack of seasons made me remember that amongst other things, I missed seeing the shadows of clouds, race across the countryside. They just started selling Jelly Babies in Doha. Oh happy day. I hear you on the painkillers though, my migraines are getting progressively worse the longer I stay here. Not ideal. Yay for jelly babies!! I presume you can’t get wine gums there… can you?? I am now feeling extremely guilty about having a constant supply of haribos and such like in the house. My youngest is dairy free so we always have a supply of all things chewy and jelly-like around – which of course I have to help him devour in order to save his teeth and body from ending up like mine! 😀 Very selfless of you! Perhaps, for those very reasons, you should introduce him to wine gums too!! We were away on holiday in Guernsey when this blog was published. However, as I have made a comment on every single one of your blogs I’m not about to start missing, just because I was on holiday. Unfortunately all the things I was going to say have already been said leaving me with almost no comments. Another fun, keenly observed blog. See you next week! Homesick and Heatstruck isn’t just the bewildered wittering of a British woman who inexplicably finds herself living in the Middle East (although it is that too), it’s also a ponderous blog about the nature of 'home' and being somewhere other. This is a pseudo-philosophical journal of my quest to thwart my sadness and silliness and embrace my new home... I hope you enjoy it. Please do leave a comment - and come back again soon. Homesick and Heatstruck has been voted one of the TEN BEST BLOGS ABOUT DUBAI! Click below to vote for Homesick and Heatstruck! 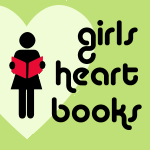 A totally amazing and inspiring site for young female readers and writers. Because blogs by established writers with years of experience & mountains of good advice are so cliché.